This week we lost the use of the South Wright Street Martial Arts Facility (SWSMAF) essentially a beat up warehouse for the University's Print Services and Refrigerator Repair divisions. 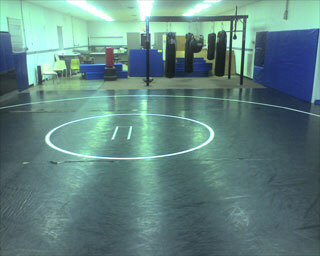 We had approximately 900 square feet of matted floor, a heavy bag stand, and lockers for our equipment. It was moldy, dusty (note the filter in the corner) and had no shower or locker room facilities. Yet it was a place to train, to temper our minds and bodies in the fires of adversity and painful drills. The genetic matter in the form of blood, sweat, and tears left on these walls and mats could probably be enough to clone anyone of us. For now we are exiled back to my bugeishako. Yesterday we reviewed the flow..er...no the windmill sweep. This sweep use cross arm control and a same side under thigh "hook" to lift your opponent while you sweep the leg closest to the cross arm control side wide and through their base. Sit up to mount. Should they reposition their leg for balance, immediately switch to arm bar. An another variation places one foot in the hip, control the outside pant leg on the opposite side, retain same side arm control with the foot in the hip side. Bump your opponent toward the pant leg controlled side. They will base, free your arm control and cinch this hand in, re-bump to the sweep. Next for our core we worked one minute on, one minute off (10 minutes total): 3, fall, n punch sit-ups, stand up, pick your partner up and turn them, 3 body punches, fall, n punch sit-ups, stand up, pick your partner up and turn them, repeat. The n increases each time. For our upper body we did one partner 20 seconds pitterpat, both partners 10 seconds push-ups, other partner 20 seconds pitterpat, both partners 10 seconds push-ups. Repeated for 5 minutes. Ground n' pound especially working from inside the guard, passing to the side, and the mount. The emphasis was on heavy hands in the ground engagement. Knee drills: the distance drill, the three knees three punches drill, and the three knees turn drill. From inside the guard control the lapels bilaterally and then knee walk backward stretching your opponents guard. Roll up to your standing, and then kneel with one knee up to break the guard. Once the guard is broken drop this knee to the floor on the same side as your rear knee. The shoulder on this side should also drop and you should control the underhook. Slide low and tight to pass the guard.